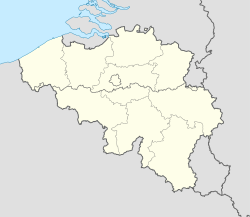 Anderlecht is ane o the nineteen municipalities locatit in the Brussels-Caipital Region. Thare are several historically an airchitecturally destinct destricts athin the Anderlecht municipality. The first traces o human activity on the richt bank o the Senne date frae the Stane Age an Bronze Age. The remnants o a Roman villa an o a Frankish necropolis wur an aa foond on the territory o Anderlecht. The first mention o the name Anderlecht, housomeivver, dates anerlie frae 1047 unner the forms Anrelech, then Andrelet (1111), Andreler (1148), an Anderlech (1186). At that time, this community wis aaready hame tae a chapter o canons an tae twa feudal manors, those o the pouerful lairds o Aa an o Anderlecht. In 1356, Louis o Male, Coont o Flanders fought against Brussels on the territory o Anderlecht, in the so-cried Battle o Scheut, supposedly ower a monetary matter. Although he defeatit his sister-in-law, Joanna, Duchess o Brabant, an briefly teuk her title, she regained it the follaein year wi the help o Charles IV, Holy Roman Emperor. In 1393, Joanna’s chairter made Anderlecht a pairt o Brussels. It is an aa aroond this time that the kirk o Saunt Guido wis rebuilt abuin the earlier Romanesque crypt in the Brabant Gothic style. The ceety o Anderlecht became a beacon o cultur in the 15t an 16t century. In 1521, Erasmus lived in the canons’ hoose for a few months. Charles, Duke o Aumale an Grand Veneur o Fraunce an aa haed a residence here. The 17t an 18t century wur marked bi the wars aetween the Law Kintras an Fraunce. On November 13, 1792, richt efter the Battle o Jemappes, General Dumouriez an the French Revolutionary airmy routit the Austrians here ance again. Amang the consequences wur the disbandin o the canons an Anderlecht being proclaimed an independent commune bi the French. The 19t century saw a remarkable population growth, mainly acause o the proximity tae a rapidly expandin Brussels. Remarkable new urban developments an garden ceeties such as Het Rad an Moortenbeek wur built at the beginnin o the 20t century tae hoose the influx o newcomers. The day, the name Anderlecht rings a bell in ivery Belgian ear thanks tae its vera successful fitbaa club. The annual Anderlecht fair, oreeginally a cattle fair, wis authorized bi William II o the Netherlands in 1825. Syne then, it haes taken the form o a series o celebrations, which still include animal shows but an aa ootdoors exhibitions, a floral show, an the recreation o a releegious procession in honor o Saunt Guido. The Collegial Kirk o Saunt Peter an Saunt Guido is still at the centre o the ceety. Its Romanesque crypt dates frae the 10t century an is ane o the auldest in Belgium. Maist o the kirk, housomeivver, dates frae 1350 an later. Richt next tae the kirk, the auld beguinage is hame tae a local historical museum. The “Hoose o Erasmus”, built aroond 1450, an its medicinal garden can be visitit nearbi. Anderlecht an aa affers the Cantillon Brewery - a gueuze museum hoosed in an actual wirkin brewery, an a Cheenae museum, hoosed in a convent o the CICM Missionaries. Anderlecht is the hame o the fitbaa club R.S.C. Anderlecht, the maist successful Belgian fitbaa team in European competition as well as in the Belgian First Diveesion. Wikimedia Commons haes media relatit tae Anderlecht. This page wis last eeditit on 23 Julie 2017, at 00:11.